This six part fugue is something of a contrapuntal miracle within the various compositions associated with Bach’s Musical Offering written for the flute-playing Prussian King Frederick II. According to documents the theme was written by the king himself, however many scholars doubt this due to the theme's unique structure. The theme was most likely written by no other than the composer himself. The theme in its pure form is only played twice during the whole fugue in each of the six parts. On the other hand a diverse interlacing of motifs derived from the theme is developed into an incredible polyphonic masterful presentation. 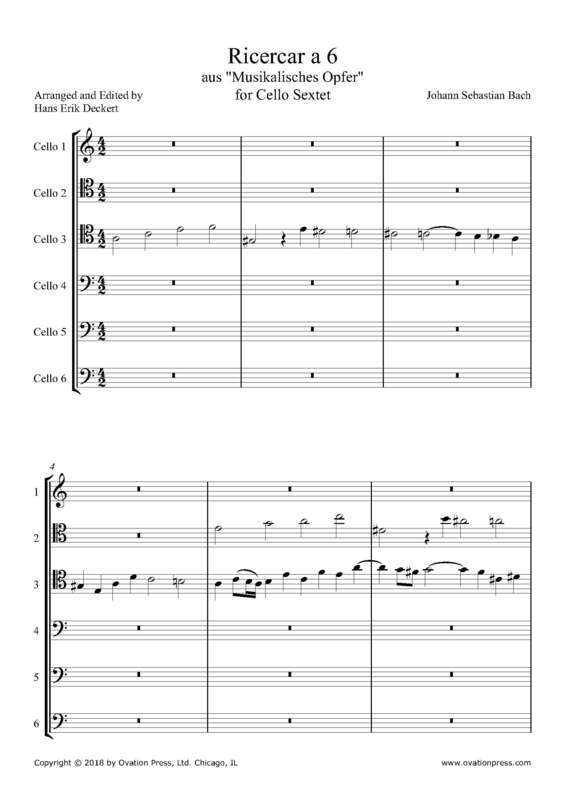 This transcription for cello sextet is in A minor - one minor third lower than the original C minor. This fugue is such a spiritual work and almost incomprehensible in its beauty that we have to remember what Goethe said when he heard Bach’s music: “I expressed it to myself as if the eternal harmony were communing with itself, as might have happened in God's bosom shortly before the creation of the world." This music is also so touching and spiritual to me that it almost seemed to me that I neither needed ears, eyes or any of the other senses in order to comprehend this music in a most spiritual intuitive way.